Here I share news, events, press, bits of my creative process, and the occasional snippet of adventure. This is one of my favorite pictures I took in Sri Lanka, just because it caught such a serendipitous moment of color -- the kind of serendipitous moment of color I'm constantly on the look out for and love to find. 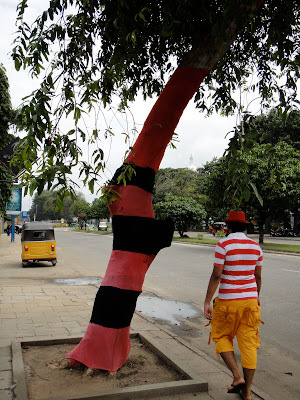 I just love the stripes of the guys shirt with the stripes of the tree and the red hat and the shorts that match the tuk-tuk perfectly. It may not be fine art or whatever, but it was a happy color moment. My wish for you today? To dwell upon any happy accidents -- fortunate accidents. They happen more often than we notice. Or maybe someone who needs it most can have a little happy accident today. Is that a strange thing to hope for? No one hopes for accidents. But what about happy ones? Those surprises in life that are unplanned. If we never had happy accidents, we might never fall in love. So I hope for a little happy accident for someone who would appreciate it today. A good one. A moment of serendipity. "Serendipity is putting a quarter in the gumball machine and having 3 pieces come rattling out instead of one -- all red" ~ Peter H. Reynolds. BIG NEWS! I'M GOING TO BE AN AUTHOR! 2016 SCBWI MOST PROMISING PICTURE BOOK AWARD! Don't these trees look like cheerleaders? I finished reading every Caldecott book! While learning my craft, traveling the world, and figuring out how to juggle being a mom with being an artist, I blogged for many years on a blogger website under the banner of Collage Clips. After many years of blogging at one site and keeping my portfolio at another, as of September 2016, I'm happy to finally have everything moved to one place.